A new tab with label "Hi-scores" has been added. I will publish Vectrex game high scores achieved by anybody who contacts me and sends photographic evidence. First one is from Vectrex game player going by the online name of KosmikVector who appears to be the Protector champion! Programmer Martijn Wenting of Revival Studios has released a slide show binary called Climax for the Vectrex. This displays and cycles through 15 pixel art works accompanied by Vectrex music. The artwork was originally created by his friend Menno Seegers in the 90's using the Amiga software package called Deluxe Paint. The images are raster images, and have been converted to shaded images suitable for display on the Vectrex. The Vectrex is tricked into displaying bit image graphics rather than its native vectors. Although vector purists may shout "where are the vectors? ", the slide show is interesting to see nevertheless. Martijn recommends the slideshow is run on a real Vectrex, because current emulators don't work well with this slideshow. Climax can be downloaded for free at Revival Studios. Regular readers of this "blog" may know that my ultimate goal is to have a Vectrex arcade machine of the type found in video game arcades. This would involve placing a Vectrex in a full size arcade cabinet. However, the one stumbling block is that the Vectrex screen is far too small and it would look very silly in such an arcade cabinet. So my quest has been to investigate ways I could achieve a bigger Vectrex screen. I've given up on actually using a large vector monitor from a real arcade cabinet, basically as these seem really hard to come by. And I don't have the necessary knowledge to convert an old black and white TV to a Vector monitor. Therefore I have been thinking about alternative ways. Earlier this year (see 23rd August news entry) I did hook up a 22" TV to a video camera and captured the Vectrex screen onto the TV. As expected, the magnified visual effect wasn't that remarkable. Firstly, the beauty of the vector lines was lost as they were pixilated by the camera. Secondly, the resolution of the camera was only 640 x 480 pixels. Anyway looking at alternative ways to make the screen larger, about a year ago Vectrex fan, DarrlyB, once reported the possibility of using a Fresnel lens to magnify the Vectrex screen. He used a commercialized version of this type of lens which is normally sold as a book reading aid. It’s like a cross between a magnifying glass and a sheet of paper. I contacted him recently to get his view of its suitability for magnifying the Vectrex screen for an arcade machine and he accepted my request to put his feedback on this website. He stated "the lens has to be quite a distance away from the Vectrex screen to work. You have to mess around with it a little to get an effect. The further away from the screen the more the magnification. Some effects are rather interesting too! When you clear a screen on Spike Hoppin', for instance, there's a swirling, nearly psychedelic effect that's not visible to the naked eye, but it works well with the Fresnel sheet (though might cause someone to have a seizure because of a ‘prism’ effect, who knows!). I, Cyborg really seem to be bigger in scope too. Other games don't really seem to show a change. I wouldn't really recommend the lens at all for some games. Protector is an example, it's near impossible to see the scanner in the game because the magnifying effect results in a big mess and it's too hard to see the scanner, making the lens completely useless." So the conclusion seems to be that when using the Fresnel lens you can get some distortion in some spots which can make the gaming area a bit hard to see. There also seem to be some strange prism effects which reveal themselves for particular games. I also suspect that if you are not directly in front of the lens there will little observable magnification. With all this in mind I am rejecting this idea for my Vectrex arcade cabinet. Back to the drawing board again! Richard H. has announced that he is now selling his VecMulti to the public. Priced at $85 including postage its not cheap, and you'll need to purchase a microSD card too and if you don't already have one, a microSD card reader/writer. The total cost is possibly an issue for some prospective users, but what you get is the ultimate multi cart and which is actually worth every penny. Basically you use your PC to read/write to the microSD card, copy the game files you want to play, run a little application that arranges the game files onto the microSD card, and then insert the microSD card into the VecMulti. The maximum size SD card size is 2GB, although there is no reason to use one that big and even using a 64MB microSD card the VecMulti is able to store everything that is available as a binary file and any future binaries. This means all the MB/GCE games released in the past, and all public domain binaries ever made. The number of binaries held on one cartridge far exceeds the previous multi cart record holder which was the 72:1 multi cart by Andy Coleman. Plus, and this is the big plus, unlike the conventional multi carts by Coleman and Sean Kelly, users can add whatever binaries they like. There are other nice things about the VecMulti too. It can operate with 64KB binaries, a first for a multi cart. Another first is game binaries such as Animaction which require extra RAM can also run. You are also not restricted to a 8 characters for the binary file names which allows more descriptive game titles to be shown in the menu. This and the fact that the menu displays the files in alphabetic order, lists the titles in groups of 4, makes the menu very easy to use. Finally, for developers, you can also connect to the RS232 connection point on the PCB in the VecMulti and download binaries without having to copy to the microSD card. This is very useful for developers and helps to reduce the software development cycle. The only disadvantage of the VecMulti I can see when compared to Richard's previous product known as the VecFlash is that you will need a microSD card reader/writer to add new binary files and you will physically have to remove the SD card from the VecMulti (this requires the holding screw to be removed and separating the two halves of the cartridge shell) and insert it into your reader/writer - all time consuming stuff. However, I think once you put your entire library on the microSD card you're only likely to want to add new binaries now and then. This product is the multi cart champion and gets 5/5 from VectrexMad! Visit www.vectrex.biz and email Richard H. to buy your VecMulti. "Vec Fu" by Michael Borrmann is the game I am currently playing on my Vectrex. The first version came out in 2007 but was just a demo. This month, Michael has released an updated version which is a really playable game now. This game is like Mortal Combat, i.e. a classic "beat-em-up" martial arts game but for the Vectrex. In the original "Vec Fu" demo you got just one enemy - a pole swirling ninja. Now there are many more enemies to defeat as you progress through harder and harder levels. So far I managed to beat Hammer, Pole, Star, and Sword wielding characters, but there are still more. The silhouette style graphics representation is somewhat like comic book single pen stroke type art:- with so simple outlines so much form and flow is captured. I really recommend this game to other Vectrex fans. Although the game can be played on an emulator, its best to play it on the Vectrex itself. So burn to EPROM or save to VecFlash and start practising your martial art moves. "Vec Fu" can be downloaded for free at the following link. Sunday 26th September - Revival Studios is back in the land of Vectrex!!! Martjin Wenting of Revival Studios is back in the land of Vectrex!!! Today I got an email from Martjin to say he was active again for the Vectrex. His comeback is accompanied by the release of two games for the Vectrex: ColorClash slim and V-Hockey. Colorclash slim is a fun action game people can just pickup and play. The player has to shoot the various gems that are falling down from the top of the screen. The gems are marked with symbols and the player has to match up the symbol on his ship with the symbol on the gems. Colorclash was available in the past but now includes new features such as vector-mode, highscore upload feature and Atari paddle support. These games can be ordered online now and will launch at the Retro Spelcomputer Beurs (Retro Console Fair) to be held in Apeldoorn/The Netherlands on October 3rd 2010. I’ve been in touch recently with the guys behind the recent "The Audience" art installation (see Sunday 5th September previous news item). They’ve sent me photos of another art installation involving the Vectrex which they made some years ago and which has not been made public before. 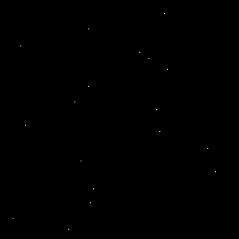 Called Snow Flake animation or in Finish "Lumisade" which translated means snow rain, it comprises three Vectrex consoles stacked on top of each other and each running a program that shows snow flakes falling across the screen. Vectrex wizard Mikko Köykkä wrote the program and has kindly agreed to make the ROM binary available here. The program is only 2K in size but captures the way snow flakes can fall through 3d space very well. I really like this video that recently appeared on YouTube - not only because of the two Vectrex consoles that are centre stage but also because of the concept - This is art!. Its a video of an actual interactive widow installation for Helsinki Design Week Windows Installations held in Helsinki Design District on August 27 - September 5, 2010. Apparently, initially the sound from the installation was coming from within the shop but the volume was set very high so people could hear it on the street, but it was too loud for the upstairs neighbours and the artist later had to put a small speaker outside the shop. One of my long term goals is to have a Vectrex housed in a proper full size video arcade cabinet. However, there are a very many challenges ahead in order to achieve this. The most difficult challenge for me is realising a Vectrex with a bigger screen. The screen is the key to making a successful arcade cabinet. The built in screen of the Vectrex is just too small. There’s no way this can be used in a full size cabinet - it just wouldn’t look right. Ideally I would want to use a 17" - 19" monitor. It would have to be vector based and hence CRT based. Forget about the electronic circuitry changes required to the Vectrex in order to operate it with a larger sized vector monitor:- the bigger problem is that I’ve been searching for three years and just can’t find a vector monitor anywhere. In the 80’s, vector monitors were a plenty, but in this age, they are no longer made, and the available supply of vector monitors is dwindling. I mean no proud Asteroid arcade cabinet owner is going to want to cannibalise their cabinet and part with a working vector monitor are they? I did read some years ago about another Vectrex fan who modified his B&W CRT TV to work as a Vectrex vector display. This might be an option, as there is still a chance to acquire B&W CRT TVs now. But again the CRT TV supply is also dwindling, as LCD TV users send their CRT TVs to landfill. My problem is, the person who converted his TV is not contactable, and I do not have the knowledge on how to modify a TV myself. Therefore this weekend, as a feasibility study I thought I would look at other means to getting my Vectrex to work with a bigger screen. The following video is the result. This shows a 22" inch CRT TV turned on its side working with my newly built Vectrex Optical Display Engine (VODE) module. What complicated new technology is housed in the VODE box I hear you ask? Ah, sorry to disappoint you all. The VODE simply houses an old 640x480 pixel digital camera operating in video mode and pointing at a standard Vectrex console. The box is present to prevent reflections from ambient light. The camera feeds compositie video into the TV via the TV's SCART socket. It’s not easy to see the actual screen quality in the video, but admittedly, I knew in advance that I would be disappointed with the final result. Not only for the fact that the resulting graphics on the TV are comprised of pixels instead of crystal sharp vector lines, but also because the resolution of the camera is poor. Ok, back to the drawing board... Anyone out there who can sell me a vector monitor, or knows how to convert a standard CRT TV to work as a vector monitor? In the weekend I received a set of Vectex vinyl decals from US based ebay seller 215andrewb. I bought these decals without any idea where I'll place them (yes I'm a sucker for anything with the word Vectrex on) and with a curiosity to see how good they were. Now having got them I've got to say that the finished product is excellent! The decals are made from Oracal 651 vinyl - which is a typical material for car stickers. Indeed the ebay blurb for the decal suggests sticking the decals on your car, refrigerator, bedroom door or anywhere else you can think of. Each decal is approx. 5cm high by 20cm wide and costs a couple pounds. The logo font is printed on transparent vinyl. I got the logo in black, but you can also get the logo in white or grey and with a choice beteen the US or Euorpean Vectrex logos. The background colour that can be seen in the stickers in the picture is the colour of the material the sticker is stuck on. If you contact 215andrewb directly and talk to him nicely, he'll even make you decals in different sizes. A couple of days ago I received Fury's new game called Sectis. The presentation is really nice, the game cartridge itself is a translucent cartridge case (haven't seen many of those before) and the game is supplied with a t-shirt! Collectors will love this. However, I think of myself more as a game player rather than a collector. Currently though, I'm still coming to terms with the gameplay. Admittedly, so far I haven't given the game the time it deserves (less then half an hour) but I'm really struggling to advance through the screens in the game. The game appears to take place in a landscape that is spread across many screens. I would guess there are many such screens since Fury said that this was his biggest game yet. The game is not presented as a giant scroller but rather as individual screens. Exiting at one exit of a current screen refreshes the screen with a new landscape view. Currently, I'm finding those Sectoid aliens that spin round your ship very hard to kill and I keep getting the dreaded "Game Over" message. So far I've only killed five Sectoids. I do like the fact that there is some strategy involved in the game. E.g. some preplanning is necessary when visiting the different screens, i.e. only go to the shield replenishers that are present in some screens when the ship shield level is really low:- This is to ensure you have full shields before meeting the next Sectoid enemy. This weekend I will have a longer session to try an improve my skills. Anyone else out there with the game? - can they offer any game playing tips? The first 100 copies sold were limited editions. But, now you can also purchase the standard edition (which is a normal black cartridge and does not come with a t-shirt) direct from Fury. The printed copy of VGT#16 has already been sent out to subscribers but an electronic preview version can now be found and read for free from this link. Although all the pages are visible you can only zoom in to read a page a few times before you can't read it any more. Plus lots of other information for other games consoles. Liked what you read? How about subscribing to a quarterly paper copy? It seems that dressing up your Vectrex when it is not is in use is currently in vogue. Only last month I announced that Barb of Nanny's Sewing treats sells Vectrex dust covers. 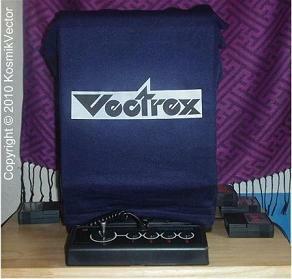 New Vectrex fan, going by the handle of KosmikVector, recently sent me a picture of the Vectrex cover that he has made. This has been made from a customised motorbike helmet bag with an ironed on transfer of the Vectrex logo. This is just a one off that Kosmik Vector made for himself, so if you need a dust cover and don't like to DIY, best you go and purchase one from Barb! You can contact Barb direct on nannyssewingtreats@yahoo.com. Friday 25th June - World Cup 2010 football fever reaches the Vectrex??? Yes folks, the power of the media (there's no escaping the World Cup 2010 wherever you look) has caused me to locate my "Heads-Up" football game cartridge and pop it into my Vectrex. Given the game vintage and the limitations expected when there are no colour graphics, it's a suprisingly playable and enjoyable game. Is this the Germay - Australia match captured in the land of Vectors? Even though the Vectrex Australians appear to have eaten their Ready Brek (probably only UK residents get this reference? ), game play from that glowing team is poor. Final football game score: 4:0. Watch the game accompanied by the infamous Vectrex buzz but without the sound of any annoying African vuvuzelas blaring in the background. Thursday 10th June - Vectrex no longer has to be naked when not in use !!! This is one of my new Vectrex covers produced by Nannys Sewing Treats. I got mine yesterday and am very happy with them. So much so I thought I'd make a small video. At the time of writing Barb of Nannys Sewing Treats sells them for $28.50 each plus shipping on US eBay. The only negative for me, was that living in the UK, I got stung for import tax - this seems to be a random event, but happens I think when the item you are importing into the UK costs more than 18 pounds - this factor made worse because I purchased two covers. You can contact Barb direct on nannyssewingtreats@yahoo.com. Vectrex Fans have different views about screen overlays. Some won't play a Vectrex game unless the overlay is present. While others prefer to see the crisp white on black vector graphics without any overlay obscuring the view - indeed, it is told that the original Vectrex game programmers weren't fond of screen overlays either because the overlays were always produced after the games were completed and it often meant that the programmers had to go back to the finished games (which they had become used to seeing in black and white during the development cycle) and re-program the position of the game graphics in order for a 1:1 match between game play and the graphics/colours on the overlay. Personally, I believe the overlays do add value to the overall game	experience. Good examples are Pole Position and Armour Attack. In the exceptional cases the overlays really do add the illusion of colour to the games e.g. Vectrexians. However, most screen overlays for the Vectrex just give a single colour back drop with some pretty graphics on the border. Even a single colour back drop on the original game overlays is still useful in itself. It can help to hide/subdue the fuzziness of the onscreen Vectors. Anyway, this preamble about overlays is here for a reason. These last months I have been busy purchasing presents for my Vectrex (err..ok, presents for me). The other day I bought a repro overlay from eBay seller "vintage-hardware". He makes repro overlays for some of the popular Vectrex original, prototype and homebrew games. These overlays are made using a printer and laminator - a different and simpler process compared to the screen printing process which was how MB/GCE used to produce overlays and how I would like to make them if I could find a suitable screen printing company. The printed and laminated overlays can never compare to screen printed overlays. The graphics are much more vivid and the colours are of much greater depth on a screen printed overlay. For that reason, it’s preferable to purchase the original screen printed overlays available for the original games. But for games (prototype and homebrew) that never had an overlay, a printed and laminated overlay is the only way currently possible to have an overlay. This is why I chose for a Dark Tower overlay. Dark Tower was an unfinished prototype by MB/GCE and never released. Although, the overlay design is known, there was never an actual overlay. The overlay I received looks pretty good when viewed above a white piece of paper. But when viewed on the Vectrex it looks dull and translucent. This is because there is no white added on the back, and the colours appear "see through" and washed out as a result. I found the thickness of this overlay a little thin and as a result it’s not as rigid when compared with the original game overlays. Other negatives are that in the overlay I received, there looks like to be a couple of very small air bubbles present (size of pin heads). The cut semi hole at the top of the overlay is also much smaller than the original overlays. This made it difficult to put on and take off the Vectrex (at least with my big fingers). I found that the overlay is quite shiny. This results in all the onscreen vector graphics appearing with a distinctive a glow. Even turning the brightness down on the Vectrex to a minimum still results in an annoying glow. This effect is less visible using an original screen printed overlay because they are not so reflective. One might expect that being a homebrew the overlays may suffer from the lack of straight edges where they should be as a result of using scissors. But this is not the case, as all cuts have been achieved by a special cutting tool giving a professional finish. Final score: 2.75 out of 5. Having said all of the above, the Dark Tower overlay is a very good effort for a homebrew (better than anything I could produce with a printer and laminator). With a bigger cut semi hole, double the overlay thickness and a white (rather than a translucent) background, this overlay could approach near perfect - but maybe the printing technology for this can never acheive this. Regarding cost I can imagine these overlays take quite some time to make, so I think the cost is very reasonable at approx 10 euros + postage. Many of you have probably already purchased Royal 21 from Fury Unlimited. However, I do know that there are still copies left from his first batch, so a review of the game may still be useful to prospective purchasers. My review of Fury's Royal 21 game for the Vectrex has now finally been published in last month's Video Game Trader (issue #15). The printed copy has already been sent out to subscribers but the electronic version can also be found online here. This magazine contains a lot of interesting info about the retro video game console scene and is free when it is viewed online. For those only interested in the Vectrex stuff go to page 12 to see the review. Monday 5th April - TRON on the Vectrex !!! "Mr RetroFind" passed on some photos of the TRON prototype that he recently made public. For more information, see his April 1st YouTube submission. I found out that RayXambeR has written a small review on my Autofire dongle in his magazine Revival (issue #41). The magazine is written in French and precedes the English translated version by a couple of issues. I used an online translation service to translate the French text and what follows is the result. This magazine covers news for the Vectrex quite regularly. Click on the image on the right to get the original French article or click on the moving image to jump directly to the Revival website to find out more. "He who defines himself as VectrexMad! could not be indifferent to the cause of the vector-only console in the world! So pity the poor button 4, he decided to design an autofire mode to avoid unwanted restraints on games like Mine Storm. Indeed, over time, playing frantically like an arcade does not help the longevity of Vectrex controllers. The autofire offers an impeccable finish, wrapped in plastic flexible heat shrink, and its small size makes it really neat. It just fits, like the Rapid Fire Unit of the Master System, between the console and the controller. The game is fun even if immediate changes ever so little (bad) habits. We found what enabled consoles like the NEC PC Engine - another queen of shoot'em up - with Integrated autofire on the pads (even if it was not the case on the first white model). However, to avoid having to remove the dongle sometimes in the few games that do not require pulling (Pole Position for example), the designer has incorporated a function to disable it. Just keep pressing the button 4 when starting the console and you're done! Here's a product that does one thing but does it perfectly. Its price is honorable, 12 pounds. This product is to order directly from VectrexMad! (sales@vectrex.co.uk). Tell him that you contact him following an article published in Revival, it's always fun! And yet one wonders how it was possible to do without it for so many years. Note that the designer should propose his first game on this console for 2010! To be continued..."
When Henk Catry showed me the following picture, I just had to ask his permission to show it on this website! The Spike article has already been available for a couple of months in the hard copy version of Video Game Trader (issue 14) magazine. Now finally you can read the magazine online and for free by clicking here. This magazine has lots of interesting stuff, but the Vectrex specific Spike article is at page 6 onwards. Also in this magazine is a small interview with me regarding the VectrexMad! Productions AutoFire dongle. Hot on the heals of the old newspaper article about Smith Engineering (see January 2010 news entry) I accidently stumbled across an even earlier article printed in the Sarasota Herald-Tribune newspaper dated September 28th 1980. The Vectrex is not mentioned but surely must have existed as an idea in their heads by then. Nonetheless, the article is interesting, mentioning Smith produced skipping ropes, the Microvision, and various sound synthesizers. Slightly more Vectrex related I found another old article dated 1984 which is a review of the game Pole Position. It’s a general article covering the Atari 5200, and the Vectrex mention is not that complimentary. You can read the scanned document by clicking "California 'Tank' Makes Great Stride With Toys" or "An auto-racing game you can really lap up". These files can also be found by going to the [Documents] tab and then selecting the Magazine Scans section. Wednesday 10th February - Vectrex buying - knowing when to stop? Today I received another Vectrex. This is my second one this year! Neither of them is fully working properly, and the idea it that they are for spares, or perhaps I combine the two to make one fully working one. It’s too easy to buy Vectrex stuff on Ebay! In fact my Vectrex hobby is generally getting out of hand this year and it seems I am turning into a collector. I also just purchased a copy of a boxed Star Castle and its overlay (rare! ), and Fury’s 3D Sector X. Well the latter is really for playing. This new distraction and the fact that I’m really busy at work has left me little time to produce anything for feeding back into the Vectrex community, so no new autofire dongles, no game development and no articles. Note to myself; must try harder in March. In case people who come here don’t read rec.games.vectrex the news there is that the Spike’s Big Page website which disappeared a few months ago is now back on a new host. There’s loads of information on the Vectrex at this website, with the promise of new things to come this year. Now, this is a call out to somebody called John in the UK who wanted an autofire dongle. Sorry, but I lost your email with your contact details. Please can you make contact again. I recently found a newspaper article about Smith Engineering, the originating company behind the Vectrex. The article was written in January 81 so if you believe the dates given regarding the history of the Vectrex in the Vectrex FAQ, in theory the Vectrex idea was already born by then. However, no mention is made of the Vectrex in the article. Nevertheless, the article which seems to be from a local (Christian?) newspaper in Boca Raton, Florida, USA, makes for interesting reading. Smith Engineering sounds a fun company to have worked for. You can read the scanned document by clicking here or by going to the [Documents] tab and then selecting the Magazine Scans section. Friday 1st January - Happy New Year !!! Happy New Year to everybody especially Vectrex fans. It's 2010 and this year the Vectrex will be 28 years of age! This month also marks the two year anniversary of this web site. I can't believe it has been two years already, I only got in to the Vectrex hobby a few months before that. It's traditional to start the year with new year resolutions or in my case I should say goals; This year I hope to release a very limited edition batch of AutoFire dongles with boxes. There's my game which although originally targeted for release beginning of this year is realistically more likely to come out in time for December this year. In addition I want to see completion of the overlay project. For the latest status on this it's always best to check on the Yahoo based group Vectrex Overlay blog. This blog is a bit quiet at the moment, but I am hoping I can push things along this year. In addition I will continue to write new articles for Video Game Trader. For issue 15 expected in March I have already submitted a review of Fury's Royal 21.